It was the early 1970s. Gary was a dedicated yogi and swami (a mediation monk in a service organization), and Radha was a student of yoga. 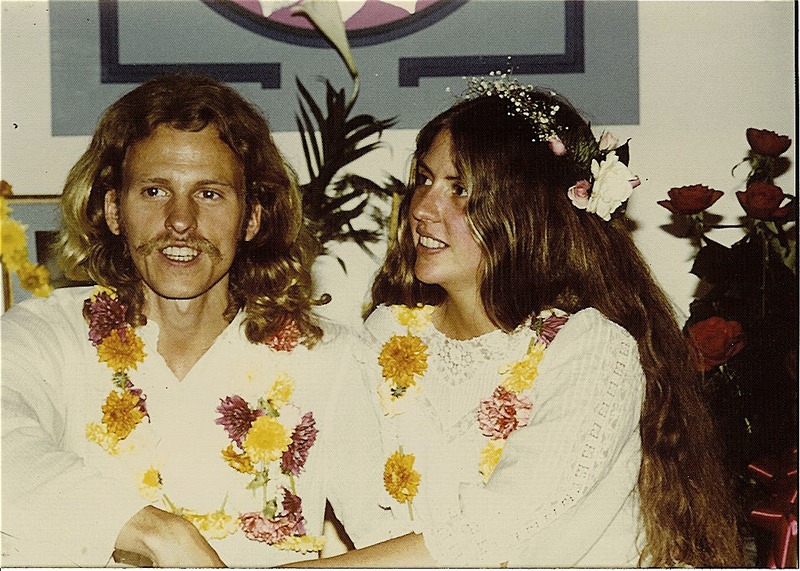 They met in Newport, Rhode Island, where Gary was lecturing and teaching at an annual ten-day silent yoga retreat with his teacher Swami Satchidananda. Radha was one of seven hundred participants. Although the paths that brought them to this place were worlds apart, they had somehow arrived at the same destination with the same teacher, inspired by the same yoga philosophy. This philosophy inspired each of them to live in harmony with nature and humanity. 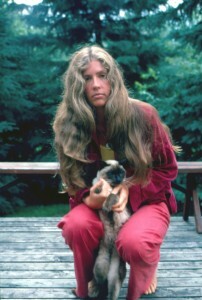 A hippie by nature, Radha received her college degree at Goddard College in Vermont. As part of her studies she had built a unique two-story geodesic dome on a pristine mountaintop in Vermont. She became a founding member of Hunger Mountain Co-op and lived close to nature, cultivating and harvesting most of her own food. Always seeking and searching for meaning, she met and married her good friend Lee, and on their honeymoon in Morocco, she came across the book Autobiography of a Yogi by Paramhansa Yogananda. While reading that book, Radha had an enlightening moment, and her philosophy of life was suddenly transformed into something much greater than even her love of the natural world. Upon returning to her everyday life in Vermont, Radha pursued yoga with a passion. She discovered the book Integral Yoga Hatha by Swami Satchidananda and soon became a student of that great yogi who was also famous for opening the Woodstock Music Festival and was the guru for many rock stars of the time. She organized classes and began practising and teaching everything she’d learned from the many yoga-related teachings she had studied. It was on her first yoga retreat, after receiving a meditation mantra from Swami Satchidananda, that it dawned on her that she had indeed become a Yogi—not just a practitioner of yoga, but also someone who yearned to live and experience yoga for the rest of her life. Meanwhile, while attending Saint Peter’s College, a Jesuit institution in Jersey City, Gary joined the United States Army Reserve to avoid being drafted after graduation. He wanted his first assignment to include law school. After graduation, with the Vietnam War raging, Gary received a pair of second lieutenant bars and was given his first assignment: to take a platoon of men into battle in the jungles of Southeast Asia. A series of life-changing enlightening moments occurred during his officer basic training that convinced him of the sanctity of all life. He was court-martialled for refusing to use a weapon against another human being. After four harrowing months, he was given permission to leave the army. Gary was then introduced to yoga by Alice, a sixty-six-year-old vice president of a professional employment agency who had hired him to take over her position upon her retirement. She and her husband were vegetarians and had spent forty years studying yoga and meditation, which weren’t as widespread as they are today. Alice took Gary to his very first yoga class, and like Radha, his life and worldview were suddenly transformed. He moved into an ashram in New York City. After completing a yoga teacher’s training course in 1972, he began his career in yoga. It was during those early days of study that he met and became a devout student of Swami Satchidananda. He grew very close to him during this time, was appointed to be on the national board of directors, took pre-monastic vows, and was sent to Montreal, Quebec, to start a yoga institute on behalf of his teacher. These were transformative years, and he benefited tremendously from the personal time spent one-on-one with his dear guru. 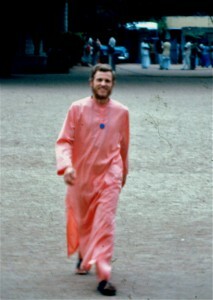 When Gary and Radha met, she was married and he had taken vows of poverty, chastity, and obedience as a celibate teacher. This was not the typical story of boy meets girl. It wasn’t until two years later, after Gary had already assisted in Radha’s mantra­-initiation ceremony, that they began to develop a close and trusting relationship in which they could freely discuss their deepest feelings, including their misgivings about their present circumstances. As their friendship developed, they assisted each other in dissolving the vows they had taken . . . and, in the process, as destiny would have it, they fell in love, got married, and created a new set of vows. Their marital vows weren’t the typical promises of a new couple beginning their life together. Being yogis, they knew—as they continue to know—that the purpose of human life is to serve the good of all. They agreed that through their union they would serve humanity and make the world a better place in whatever small way they could. They already knew that they had to build their healthy and peaceful marriage before they could help others. And that is exactly what they went on to do. After seven years of directing their teacher’s nonprofit service organization in Canada, and after their first wedding anniversary, Gary and Radha moved back to Vermont, lived in Radha’s dome, and started their own nonprofit organization, Essence: Centre for Creative Services. Gary pursued his master’s degree in psychology, which drew upon both Eastern and Western theories of psychology and philosophy. It included an around-the-world trip that began with a teaching invitation from the founders of the Findhorn Foundation in Scotland, Eileen and Peter Cady. For the next nine months, Gary and Radha visited spiritual and psychological centres, accumulating knowledge and gathering information to incorporate into their understanding of how the world functions. Radha supported Gary both intellectually and spiritually throughout his education, and although he was the one who received the degree, he gives Radha much credit for assisting him so devotedly during his studies. After Gary graduated, he combined his psychology background with years of studying yoga and meditation (specifically the system of Raja Yoga), an ancient “instruction manual” for mastering the mind. Soon, Gary was offering courses to health professionals in the medical, business, and psychological fields. A turning point in Gary’s career occurred when he took a two-year training program to become a Hakomi therapist. He studied with the acclaimed psychologist Ron Kurtz. Ron had been the resident psychologist at Esalen Institute in Big Sur, California, in the 1960s and was the founder of the Hakomi Method of experiential psychotherapy, a body-centred therapy that is still a forerunner in the field of holistic psychotherapy. Combining this information with the knowledge acquired while studying and practicing yoga, Gary developed a therapeutic process that he uses with his clients today. He has discovered the importance and relevance of keeping our empathic nature functioning at the highest level with clarity and detachment, which is necessary to navigate life successfully. 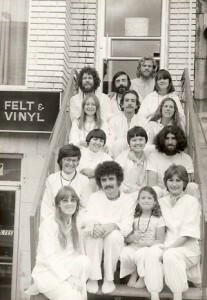 In 1979, upon returning from their around-the-world trip, they met Dr. Peter Albright, who was then the president of the American Holistic Health Association of America and keenly interested in starting a holistic health centre. As their friendship with Dr. Albright blossomed, they opened New Directions in Health in St. Johnsbury, Vermont, in 1980. The protocols they developed had tremendous success. Years of working in drug-rehabilitation centres, as well as four hospitals and all of the YMCAs in Montreal gave Gary extensive knowledge of how to bridge the gap between yoga and Western medicine. During that time, Gary and Radha developed holistic treatments and various programs that Gary still uses today in his coaching practice. As both centres thrived, Gary and Radha were busy serving clients and offering classes, weekend retreats, and a residential program. During the 1980s and 1990s, they left both centres in the hands of their trained staff and took yearly three-month sabbaticals and travelled to a meditation centre in the Himalayas of India to learn and directly experience the ancient teachings of yoga firsthand. 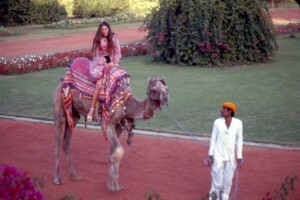 To date, they have visited India eighteen times. Gary and Radha have had their ups and downs, as any married couple would over the course of thirty-four years. About ten years ago, while celebrating their twenty-fifth wedding anniversary, they reevaluated their relationship and honestly examined their opportunities and challenges, making important adjustments in how they interact and how they would proceed with their marriage while maintaining their vow to serve others. 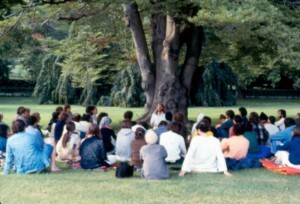 Through these continuing discussions, they shared many enlightening moments that shone a bright light on the next step for them: it was time to develop their own relationship workshops that would offer unique programs that would seamlessly combine the ancient wisdom of India with the body-mind psychology they had been practicing for decades. Learning so much over the years, having had so many wonderful experiences, and having succeeded in navigating many trying times, they knew that their next step was to share what they had learned with others. Now, nearly forty years since they met, their experiences have led them to this page. In keeping with their wedding vows, they have written the book Enlightening Moments to be of service to the world. This book is the marriage of their combined wisdom. Moreover, through their workshops and programs, Gary and Radha have successfully created a shortcut for people who want to get more out of life right away without having to spend forty years in practice, study, and integration, as they have done. In developing their relationship programs, they were delighted to discover that participants would leave with a clear understanding of the work they needed to do to achieve the next level in their life. They’ve been excited to see firsthand the transformation in so many individuals with whom they have had the pleasure of sharing their teachings as well as those in their community who have worked closely with them in developing these techniques. What strikes Gary and Radha as most significant is that their students and clients have so many more options available to respond successfully to the challenges and opportunities in their lives.